STARTS Residencies support artistic residencies that bring original artistic contributions to technology-based projects. Inside-Out: Knitted DNA, Chromatin structures visualised as knitted fashion pieces, is the project awarded to Caroline Vogler and the CRG. The designer Carolin Vogler and scientists at the Centre for Genomic Regulation (CRG), part of the Barcelona Institute of Science and Technology (BIST), will start a new collaboration bringing together art and science, thanks to the STARTS Residencies programme. The laureates were announced last Thursday, 28th March, during the STARTS Residencies Days, held at the Centre Pompidou in Paris. The STARTS (Science, Technology, and the ARTS) Initiative, supported by the Directorate General for Communications Networks, Content and Technology of the European Commission, promotes the inclusion of artists in innovation projects. It aims to remove the boundaries between art and engineering to stimulate creativity and innovation. The purpose of Vogler and CRG collaboration is to create awareness of the natural beauty in life sciences research, and make genetics and genomics more approachable to the public. Vogler will create genome-inspired knitted fashion pieces that will allow translating complex scientific topics into common and nice objects. An important aspect of the artwork will be to enable the public, going beyond the visual display of a dress, to experience it on different levels, detailed as follows: a) Tactile, the final art pieces will be experienced through touch giving the art exhibition a second sensorial dimension; b) Visual, complex modern patterns based on scientific data, reflecting them in an aesthetic and modern way, will show that DNA can also be the base of personal expression and personality; and c) Experience, the public will be able to see the creation of the artwork as it is done, as if they were watching DNA replication live. By combining science, fashion and technology, the blueprint of life will be visible to the human eye. One of the pillars of STARTS are the STARTS Residencies, which support and fund between 2017 and 2020, 45 artistic residencies that bring original artistic contributions to technology-based research projects. During each STARTS Residency, a technological driven project collaborates with an artist, leading to the creation of an original artwork, and to the development of the innovative aspects of the tech research. A grant (up to 30,000€) is awarded to the artist of each STARTS Residency as a contribution to her/his involvement in the residencies programme. The CRG submitted a ‘technology project’ proposal to STARTS Residencies in October last year, in the framework of the EU-funded H2020 ChromDesign project, coordinated by Luciano Di Croce. The main objective of the proposal was the development of visual artwork to illustrate the complex 3D organisation of the human genome over time, and its relevance for the correct functioning of our cells and our body. After that, artists had time to apply for a collaboration with one of the presented technology projects. CRG received several applications from artists from very different fields with suggestions for collaborations, including the awarded fashion inspired proposal by Carolin Vogler, entitled Inside-Out: Knitted DNA, Chromatin structures visualised as knitted fashion pieces. A multidisciplinary team at the CRG, including scientists, scientific project managers and science communicators reviewed and ranked the artists’ proposals in November last year. This ranking was respected afterwards, during the actual evaluation process of the official jury of STARTS Residencies. From all selected ‘tandems’ of technology projects and artists, the jury of STARTS Residencies selected the most original collaborations, including Vogler’s proposal. The collaboration will start in April 2019. The STARTS Residencies Days were organized by the STARTS Residencies European Program coordinated by IRCAM. 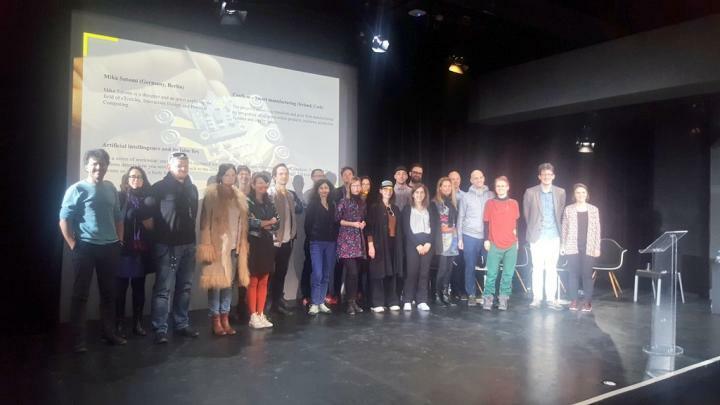 The results of this program of collaboration of artists with technological projects throughout Europe were presented through contributions by 30 artists and researchers involved, roundtables and participatory events. The laureates of the third call are were announced and the new modes of contribution of artists to innovation processes were discussed with the heads of institutions and communities involved. The STARTS Residencies Days were organized as part of the VERTIGO Forum, a series of symposia and societal debates on art-science relationships at Centre Pompidou from March 27th to 30th on the theme “La Fabrique du Vivant” together with the exhibitions “La Fabrique du Vivant” and “Erika Verzutti” which constitute the 2019 edition of Mutations / Creations, a joint yearly event by Centre Pompidou and IRCAM.